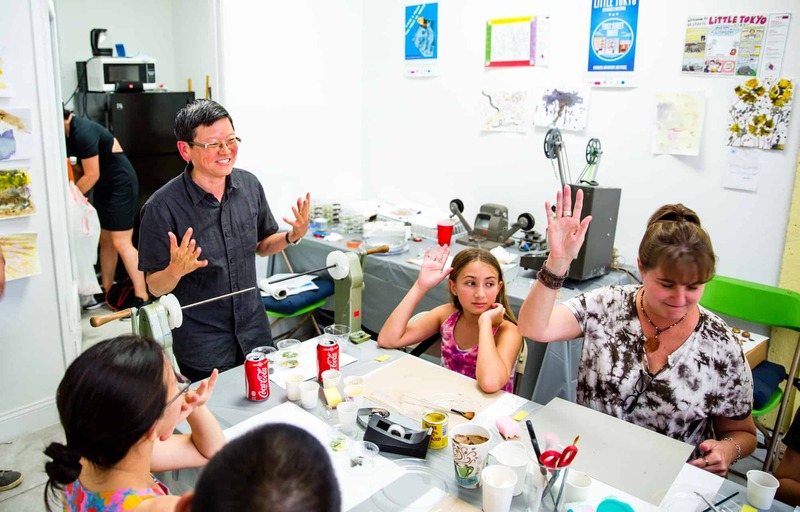 Little Tokyo Service Center (LTSC) has announced its 2019 +LAB Artist Residency Program. A Call for Entry on the CAFÉ (https://artist.callforentry.org/festivals_unique_info.php?ID=5949) site is now active for artists who live and work in California. The application opened Nov. 16 and closes Jan. 15, 2019, at 10:59 p.m. PT. The 2019 +LAB Artist Residency is a creative place-keeping residency focused on addressing the most recent cycle of displacement that is affecting Little Tokyo. Four community-engaged artists are needed for three months from June 1 through Aug. 31, 2019. They will help LTSC successfully advocate for the responsible development of two highly contested parcels of land owned by the City of Los Angeles: First Street North (FSN) and the Mangrove block (Mangrove). The selected visiting artists will be supported by local arts organizations that will provide a professional link to the Little Tokyo community and access to a variety of organizational and practical resources. Participating cultural organizations in the residency program are the Japanese American Cultural & Community Center, Japanese American National Museum, Sustainable Little Tokyo and Visual Communications. The residency is designed to be an immersive experience in the Little Tokyo community. All of the artists will live rent-free at the Daimaru Hotel on First Street and receive a monthly stipend along with a project budget. LTSC seeks artists whose creative practice reflects a desire to work collaboratively or within a community context; who reflect an awareness of culture, socio-economic and political paradigms; who have a demonstrated interest in subject matter addressing either the history of Japanese American communities or other communities of color; who have experience in other communities that are facing displacement issues; and who are willing to be engaged with the residency program through their art-making disciplines, including: social and civic practice; architecture, landscape architecture, visual art; photography, media; design; graphic design, writing; dance; music or traditional art. The +LAB Artist Residency Program is funded by a Community Development Investments (CDI) grant from ArtPlace America. LTSC was one of six organizations selected for the program, which explores how community-based organizations — not previously focused on arts and culture — can make the arts a sustainable part of their work.